Abe eyes diplomatic win with Xi Jinping visit but faces balancing act between China and U.S.
BEIJING - Prime Minister Shinzo Abe will likely be eager to take advantage of Chinese President Xi Jinping’s upcoming visit to Japan to flaunt his diplomatic clout, especially in an election year. But Abe will need to play a careful balancing act between cozying up to China and maintaining the relationship with Japan’s closest ally, the United States. 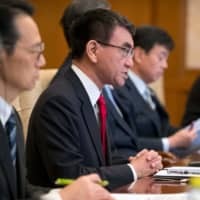 On his three-day visit to Beijing from Saturday, Foreign Minister Taro Kono was on a mission to further a recent improvement in Sino-Japanese ties following years of animosity over a territorial dispute and differing views on wartime history. Kono appears to have been successful: He wrapped up the trip by telling reporters that Xi, who has not come to Japan since coming to power in 2013, will be among the leaders from the Group of 20 major economies gathering in Osaka in late June. That will give Abe, who is seeking to solidify his power heading into his last years in office, the opportunity to play the magnanimous host to Xi. Jeff Kingston, director of Asian Studies at Temple University Japan, said he expects Abe and Xi to set aside their differences and make nice for the cameras. With U.S. President Donald Trump also scheduled to make a visit in May, an Abe aide said it was a “chance to score” for the ruling Liberal Democratic Party ahead of an election in the summer for half the seats in the House of Councilors. Abe could use the boost, given he has made little progress in efforts to recover Japanese nationals abducted by North Korea in the 1970s and 1980s, or to negotiate the return of Russian-held islands off Hokkaido that were seized by the Soviet Union after the end of World War II. He has also been left out of the loop in talks between the United States and North Korea on a denuclearization deal. But a shift toward China carries its own problems. Many in the international community criticize the Chinese government for failing to enforce rules protecting intellectual property rights or crack down on the forced transfer of technology from foreign firms. 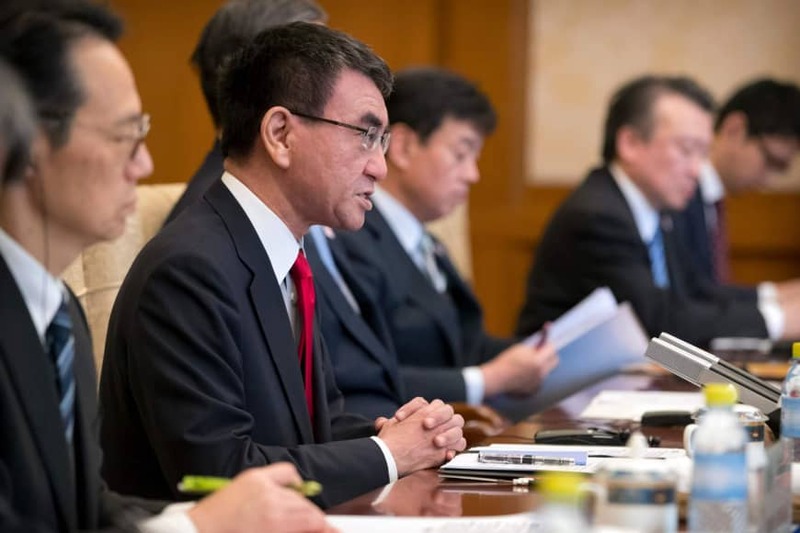 Kono said he raised the issue in a high-level economic dialogue with Chinese officials during his stay in Beijing, though he declined to say what response he got. The U.S., which Japan heavily relies on for national defense, is increasingly focused on countering Chinese efforts to assert its military presence, including in the realms of space and cybersecurity. The subject will be the main focus of ministerial-level security talks between Japan and the U.S. later this week in Washington, according to an official at the Japanese Defense Ministry. “The Abe administration sees diplomacy as a tool to boost its popularity. It appears there is little consideration for security or what the rest of the world is thinking,” said Kazuo Yukawa, a China expert at Asia University in Tokyo. “Of course, improving the relationship with China is important, but I have doubts about how well thought out a strategy this is,” he added.